The Cabbage doesn’t have a washer and dryer yet, so we’ve been doing laundry at Mom’s since we moved. (Thanks, Mom!) About a month ago, though, we found a cheap washboard at the General Store. It waited in the bathroom, unused, throughout those last, few busy weeks of the school year. Then summer break came, and I decided to try my hand at hand-washing. In a horror movie, this is where the scary music would start. Unfortunately, I did not take time to photo-document the mess that followed. My sister, Lisa, chided me for that when I told her about the failed laundry experiment later that day. “When things go wrong, take pictures!” she said. Next time, I’ll listen to her. For now, you’ll just have to take my word. It wasn’t pretty. Fortunately, we can all learn a few things from my mistakes. I should point out that the Mother Earth News article I referenced before embarking on my laundry-washing journey emphasized this point. The idea is to have one basin for washing, a second for rinsing. With a bit of planning, this method allows the launderer to conserve water. Wash your white clothes in basin one, transfer them to basin two for rinsing, and re-use the gray water in basin one for a second load of clothes. Being short on basins and attempting a relatively small batch of laundry, I decided to try the process out in my clawfoot tub instead. That was a mistake. Without a second basin, I had to awkwardly drape the wet clothes over the side of the tub while I re-filled it with rinse water. It also leads me to lesson number two. 2. Do the washing outside. Or at least in a room with a drain on the floor. Definitely don’t do it in the bathroom, unless you’re planning to mop the floor anyway. Because — take it from me — no matter how long you scrub your clothes against the washboard, or wring them after rinsing, they will still drip when you take them out of the tub. And if you use a pretty wicker basket, like I do, water will continue to drip through the open-weave and onto the floor. Then they’ll drip even more when you take them out of the basket and hang them up on the line.By the time I was done, the bathroom and I were both soaked. I’m not talking caught-in-the-rain soaked. I’m talking it’s-a-good-thing-my-cell-phone-wasn’t-in-my-pocket soaked. The clothes I was wearing ended up joining the wash load on the line. Next time, I might just do laundry in a swimsuit. 3. Do the sniff test. This is one benefit of hand-washing clothes — in the machine, you just toss everything in with a bit of soap and hope for the best. With hand washing, everything gets your individual attention. This means you can treat the coffee stain on the sleeve of your white t-shirt with a little bit of TLC and watch it fade as you scrub it. None of this waiting for a load to see if your stain-treatment worked crap. On the other hand, as I was rinsing one of Drew’s undershirts, I caught a whiff of B.O. beneath the peppermint scented Dr. Bronner’s I was using as laundry soap. And who did I have to blame for it? Just me. I ended up re-washing all of the undershirts just to be safe, this time sniffing during the washing process, not after. “But isn’t sniffing laundry kind of gross?” you might ask. Sure, but not as gross as catching that same eau-de-B.O. from supposedly clean clothes. Maybe seasoned hand-launderers have a way around the sniff test, but until I figure out what it is, I’m using my nose. 4. Dirty laundry is dirty. Having been raised by a germaphobe, I compensated by developing a sometimes too-healthy relationship with dirt. 30-second rule? You betcha. I have maybe even sometimes been known to snag a pair of jeans from the dirty laundry pile when I have nothing else to wear. So to me, the pile of whites I started with didn’t look all that bad in the basket. You can imagine my horror, then, when I discovered just how gray the water in the tub had turned after washing them. And these weren’t even our grubby work clothes, just ordinary white clothes. Still, they covered the bottom of the tub in a fine layer of filth. Dirt. Sweat. Stale coffee. Pine needles. Even a dead bug. (Okay, maybe city dwellers don’t need to worry about those last two, but still . . .) It grossed me out, and that’s saying something. I had to wash the tub afterwards. 5. Wet laundry is heavy. The wicker basket full of laundry weighed practically nothing dry, but dripping wet, it took real effort to lift. This was an annoyance to me, but an opportunity to our indoor-only cat. Nicky took advantage of my distraction to dart between my legs as I struggled to open the door while balancing the laundry basket, wet clothes dripping on the floor all the while. By that time, I was so frustrated that I just let him run around while I hung laundry on the line. And did I mention that wet laundry is heavy? We don’t have a fancy laundry set-up yet, so I just bought a roll of laundry line from Fred Meyers and tied it between my power pole and a nearby tree. I climbed up on a step ladder to tie it higher than my head, and pulled the line as taut as I could manage. Still, what happened when I pinned the wet clothes to it? That’s right, it sagged.It sagged right down to the ground in the middle, covering half of my freshly-washed white clothes with pine needles and dirt. I was pretty much fed-up with laundry by then, so I gathered all of the affected garments up, threw them back in the basket, and drove them down to Mom’s. You win, laundry. There are some chores that you can do while breakfast is simmering on the stovetop. It turns out that hand-laundering is not one of them. I started a batch of congee before laundry, figuring the long cook time would give me more than enough time to wash and hang my clothes. Wrong. Washing laundry by hand takes time. So does rinsing it, and wringing it, and hanging it up on the line. Not to mention tracking down the cat. I finally found him playing on an old piece of abandoned farm equipment back behind the pump house. Anyway, by the time I got back to the cabbage, the timer had been blaring for God-knows-how-long. Fortunately, congee is pretty forgiving. It was dryer than I’d like, but still edible. That’s more than I can say for whatever Nicky ate during his excursion. Within an hour, he’d had a bout of diarrhea all over the floor. Good thing that happened after I ate my congee. Otherwise, between that and the dirty laundry, I’d have been too grossed out for breakfast. 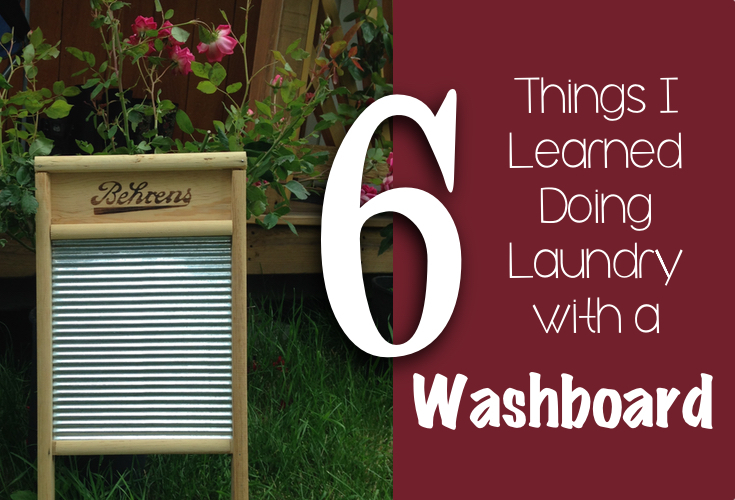 So will I wash laundry the old-fashioned way again? Sure. But not until I buy a couple of basins and a stronger laundry line, and figure out a better system than the old power-pole/pine tree combo. Until then, I’m sticking to Mom’s. Thanks, Mom. Our grandmothers were not fools, how about a hand wringer–a bit expensive if new from Amazon, perhaps available used somewhere nearby. Poor Mindy! Honey I give you an A+ it isn’t easy trying to go from photos and drawings that one has seen in books and thinking it will be a snap. Get yourself a brush also, a little bigger than a nail brush, use that for deep stains. I can remember my Grandmother and my Mum doing the laundry by hand so I remember a few tricks. SORT: This is a big help because you can use a paint pail or large pail with some water and bleach…..in go all the heavy stained clothes to soak a bit while doing the rest of the laundry. DRYING: Have Andy get you a long 2×2 inch by 6 foot long piece of lumber. Put a large notch in one end. Hang your clothes and, as it starts sagging, place the stick with the clothesline in the center, notch it, then abut to hold up. It will stay, HONEST! When you take your wet clothes out (and, in all honesty, until your hands get used to it it is better to have another help you.) Wring the clothes out and: LEAVE THEM IN THE TWISTED SHAPE, when you get outside to the line a rough SHAKE, snap it in the air to get wrinkles behaving, and pin on the clothesline. Just one pin, let the item of clothing just hang on the other end, then take your next item double it where you will be putting the clothes pin, and hang it up, this way you always have your next item hanging and not on the ground. ALWAYS get a paper towel, old washcloth, or item of old clothing and run it down your line to clean off bird poop and grime just from the wind blowing, otherwise you will have a black line showing you where it was on the line. IMPORTANT STEP #2: Keep going outside and pick up every other piece that is hanging and gauge if you think it is dry enough. If still very wet leave a little longer, if somewhat wet, take it off the line and roll up like you are putting in a suitcase. Next time you are at a Dollar store find a top that fits into a old pop bottle or little neck bottle, insert top into bottle now you have a sprinkler for ironing! (I will look for one over here.) Take the rolled up piece of clothing, iron and use the water to sprinkle if it gets too dry. There are also little Doo-hickies (love that name!) that you put all your pegs in and it is on a metal frame and moves down the line with you, but right there to get a pin when you need one. I hope they still make them, I will look. welcome to Pioneer Days! Hope this makes a little sense. You see I AM older than dirt! LOL!!! You can always give me a call and I will be more than happy to fill out the badly explained that I have written, remember, people have been doing this for years! I used to say to my Mum (Andy’s Nana) that I knew how pioneer people felt after having to do this for a while, and you can certainly see why Laundry Day was a whole day and you got nothing else done! Hang in there, at least you know that a wonderful electric washer and dryer are there if you need them! Hope this helps. Running a wet cloth down the line is super important, otherwise you have bird doo-doo and dirt adhering to clothes. I will be on the lookout here for a clothes pin holder and a water top for a sprinkle bottle. You are doing great, Gary and I are proud of you!